We thought the blame-shifting in the Malema-rifle-video story couldn’t get any weirder, but in SA it always can. 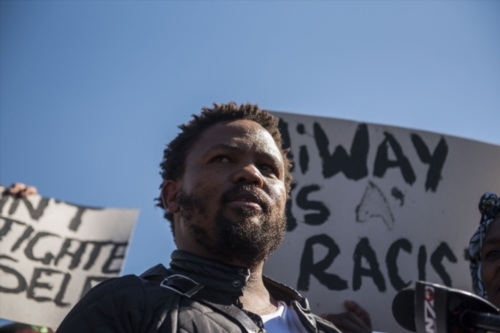 As much as many journalists and editors have had their difficult run-ins with the leader of Black First Land First (BLF), Andile Mngxitama, he plays the important role in our public discourse of playing the village idiot. It’s a tough job, but someone has to do it – and he often does it so well. It’s nearly impossible to pick out what has been his daftest moment – because there have been so many – but this morning’s announcement that the BLF would be laying charges against the “white settler” who handed an assault rifle to EFF leader Julius Malema must surely rank in the top five. Firstly, in its press statement, the party betrays that they don’t even know what the name of the so-called white settler is, even though the identity of Malema’s bodyguard in the video, Adriaan Snyman of Bluff Security, was reported on from the very first news article that broke about the story. Secondly, the BLF’s often stated principle that they will always side with any and all black people in any scenario if there happens to be a white person involved in it has now reached the apogee of absurdity. It’s well known that Mngxitama and Malema are strong political opponents, but the moment Mngxitama saw a white face in that video, his instinct to blame the white man for everything kicked in. Even if Malema had killed someone accidentally, one can only assume that Mngxitama would have found a way to blame it all on the only Afrikaner in the picture. Of course Snyman will hopefully have to answer for his involvement in what happened when Malema allegedly discharged live rounds at a stadium in a populated area of the Eastern Cape on Saturday. But that investigation of him would surely happen whether the BLF lays charges against him or not. For a security officer to hand over a weapon to his principal, who then fires it dangerously, surely cannot be condoned. For the BLF to cook up a complicated conspiracy theory that Snyman was somehow secretly hoping black people would be hit by the bullets from the rifle, and to then compare Snyman to the forces who divided and conquered black people during apartheid, betrays just how far beyond the pale (pun not intended) the BLF’s ability to reason even semi-logically has gone. It’s actually sad that it’s even possible such paranoid ideas can still be formulated in a human brain in South Africa towards the end of the second decade of the 21st century. Some might say Hendrik Verwoerd would be smiling in his grave. Sad as it is, it’s important to call out nonsense when we see it. We thought we’d already seen the worst of the absurdity when the EFF tried to make us believe the gunshots we heard in the video were actually just the sound of fireworks coincidentally going off at the same time. But things can always get weirder in South Africa. It feels like, for Mngxitama, he’s reached that moment in the small hours of the morning when the party’s gotten out of hand, too many drinks have been imbibed, and he’s starting to rant in ways that he won’t remember in the afternoon when he finally wakes up from his stupor.